1. Packing boxes are used almost everywhere. What type of card is used to manufacture typical packaging boxes? Draw its cross section. Most packaging boxes are manufactured from corrugated fibreboard. 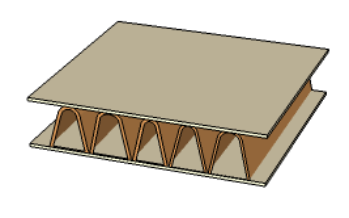 This is fluted corrugated sheet, held between two flat boards. 2. Why is the card you named in question 1, used in brown packing boxes? Corrugated fibreboard is used because it has a good strength to weight ratio. Packing boxes have a short life cycle from manufacture to recycling. These boxes can be readily recycled. 3. Thermoplastic film is regularly used for packaging. List examples of thermoplastic film. Low density polyethelene is the most widely used thermoplastic film. Other thermoplastic films include; Acetate, PVC and PLA (polylactide). A modern alternative is Ecofilm. This is a high performance, biodegradable and compostable film, Also supplied in the form of bags (plastic carrier bags). Within weeks of disposal, this material degrades into carbon dioxide and water. 4. Why are thermoplastic films used for packaging? They are used for packaging as they are transparent, allowing the customer to see all or part of the contents. This type of material can be recycled and as such is environmentally friendly, if placed in recycle bins. 5. The symbol seen opposite is applied to a common thermoplastic. Name the thermoplastic and describe its typical use. 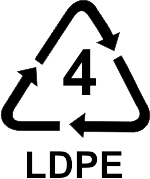 This thermoplastic is a Type 4 called LDPE, better known as Low-Density Polyethylene. It is used to manufacture plastic bags and shrink wrap. 6. 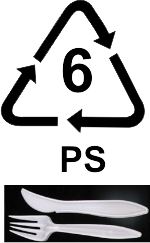 The symbol seen opposite is applied to another common thermoplastic. There is a photograph of a typical use of the thermoplastic. Name the thermoplastic and describe another practical application. This thermoplastic is a Type 6, called PS or Polystyrene as it is more commonly known. It is used to manufacture disposable utensils and protective packing.